Mouna Ragam (Silent Tune) released in 1986 marked the arrival of an intelligent filmmaker. Mani Ratnam had earlier directed Unaru (Malayalam), Pallavi Anu Pallavi (Kannada), Pagal Nilavu and Idaya Koyil (Tamil) but they did not create any ripples at the box office. He was noticed in Pagal Nilavu, which went on to become a cult classic but at that point in time, it had few takers. In his next film Idaya Koyil, for the first time and perhaps the last, the director had agreed to work on someone else’s script. The cast was predefined and baggage like garish costumes (Radha) came along with the cast. Mani was forced to cast Ambika as the virginal innocent village girl. Mani could not find his rhythm in a script that had Radha coming to college in a horse! The result was obvious, Idaya Koyil, arguably Mani’s worst film, ended up a commercial disaster. And that was supposed to have been his end in the unforgiving and ruthless film industry. After all, Mani was the director of the first dud produced by Motherland Pictures (Kovaithambi), which till then had a dream run.But the lead actor in Idaya Koyil did not give up on Mani. He gave interviews saying that Mani was the best director he had worked with! (Tall claim at that point in time considering Mohan had worked with the likes of Mahendran, Singeetam Srinivasa Rao and Balu Mahendra). But the actor’s intuition was proved right. Mani’s brother G. Venkateswaran gave him an opportunity to script and direct a low budget flick and Mouna Ragam came out in 1986. But many people did not notice that the film was an intelligent adaptation of Mahendran’s Nenjathai Killathe! The story line was almost the same…a fiercely independent, yet family loving girl gets married due to the compulsion of her family, is unable to let go of her first love, but eventually comes to terms with her marriage due to her unbelievably good natured husband. Mohan, who played the flawed lover in Nenjathai Killathe, played the good natured young man in Mouna Ragam. (This style was again repeated in Raavan, where Vikram played the protagonist in Tamil and Antagonist in Hindi)! Nenjathai Killathe was a very sensitive film, but watch it today and you might find it extremely slow. Mohan’s character in it was so boring and one dimensional that you wonder how an intelligent girl like Suhasini could fall in love with this guy! Mani took many elements from Nenjathai Killathe to pay his tribute. Both the films emphasized mood over dialogue to narrate the story. But Mani reworked on Nenjathai Killathe by making the characters more interesting and livelier in his adaptation, more contemporary. Manohar, played by Karthik, got a role of a life time and he was absolutely charming. Revathi as Divya became an instant dream girl for many young guys. V K Ramasamy as Mohan’s boss, and the actor who played the Punjabi neighbour at Delhi added excellent flavour to the film. Ilayaraja’s BGM was again an intelligent adaptation of his BGM in Nenjathai Killathe! There were several moments in Mouna Ragam that had made it into a timeless classic – the Karthik episode (taken mostly from Mani’s own Pallavi Anu Pallavi), the initial scenes where Divya is introduced as a bubbly and independent young girl, the songs, the BGM, the picture post card locations at Delhi and Agra and so many more. But to me, Mouna Ragam marked the arrival of Mani the director. His trade mark stamps started becoming visible in Mouna Ragam. Take, for instance, the scene where Divya wants to cook for her husband on the occasion of completing one month of her moving to Delhi. While CK (Mohan) is in office, she takes the help of neighbourhood boys to reorganize things at home! Or the scene when her father slaps her, she walks out of her house, sits on a compound wall till her temper subsides and returns home. (The same character trait is intelligently again used in the latter portions). Or the title sequence which subtly tells you that it is the story about a girl growing up and becoming a woman! Or the best scene in the film –when Divya thanks the Punjabi neighbour for helping her out in times of crisis, he says ‘Podaa Daiii!! He named it Mouna Ragam – Silent Raga – but it was more of a subtle symphony!! Mouna Ragam incidentally was horribly remade into Malayalam as AVAL KATHIRUNNU, AVANUM. . Mammootty essayed the character portrayed by Mohan; while Mukesh stepped into the character immortalised by Karthik while Moon Moon Sen was cast as the lady protagonist. A scene by scene faithful adaptation of the Tamil original; the movie was disaster…primarily because of the miscasting of Moon Moon Sen.
worth watching it 1000 times.Marked the arrival of Maniratnam.Even the posters oozed class!I still remember them. Raja sir rocked. Mouna Ragam’s BGM is still a popular ringtone! No mention abt PC Sreeram 😦 Cinematography was a visual treat! If i’m right this is the 1st film mani joined hands with P C Sreeram! I am big Mani Fan … specially after watching Iruvar and Thalpathi. I loved this film … simple and emotional film, i loved the transformation of Divya and her Husband Chandra Kumar. But i feel cheated by the characterization … film starts with funny joyish character of Divya … and then it moves forward to a point where she is married to Chandra and we see a flashback … where we come to know about tragic love story of Divya … where her boyfriend Manohar was killed … and that was the reason she gives when rejecting Chandra … Fine … by the time we all are well almost more than an hour into the film. I did not know exact run time at this point but point is as audience we all already in the film enough to forget the start of the film, where Divya’s character shown as bubbly, playful, mischievous and yet very normal girl, there is scene she throws bucket of water on brother and sister in law and then there is a song with her friends. Logically this is all happening after the death of Manohar and end of her tragic love story, if try to rearrange the story linearly. I dont know what to make of it. In the film and Because of Manohar she is rejecting her marriage, foolishly risked her fathers life but yet just before she more happy and mischievous than normal girl would be … This is totally goes against her character,who would fiercely oppose a ideal husband. But because when we come to know about Manhohar we are already seen half of the film, we conveniently forget start and inconsistency in characterization. I am not saying that it is sin. But had Mani would done it today … Have you guys let him go? Yes he made epics, but this is not a epic, please dont make it epic just becuase he went on to make epic. Neverthless … He shown signs of traademark style right from Pallavi Annupallavi, just because this film made known, doesn’t make it better than previous … I loved this film as good as i would have love Pallavi Annupallavi … and i watched despite not understanding the language. Point is dont judge his work because he is legend now … judge it on Merit! You have some vital points and need to re-visit it again…. Last few lines were metaphorical … Despite the flaw i love Mouna Ragam … And yes subtlety is there … but i wont say strong take on relationships. I say again it is very very good film. But just because it made Mani Ratanm well known commercially doesn’t make it classic. Saw this film finally and quite liked it. When it comes to depicting relationships esp.between the men and the women amongst the other relationships, very few people are able to bring out the nuances of the relationships, the way Mani Sir does it. And this film is no exception. Apart from these flaws, Mouna Raagam is yet another good offering from Mani Ratnam which takes a rather realistic, subtle look at human relations. The BGM by Iliaiyaraja is yet another ace along with PC Sreeram’s cinematography with some very good performances. As the major chunk of the story is set in Delhi, it was quite good to see people apart from the lead actors speaking in Hindi and not Tamil unlike the usual trend. One important point to consider was this is the film with which Mani announced that he was the best person to handle a mature post-marriage romance track(which mostly otherwise doesnt even make screenplay material). Just think mohan-revathi, kamal-saranya,mamotty-geetha & rajni-bhanupriya,aravind swamy-manisha,aravind swamy-madhoo, its just endless(with madhavana-shalini being the most epic). However small or long, simple or complex his movies post mounaragam have always been paisa vasool just for the man-woman angle alone irrespective of anything else in the movie. I watched the movie a week ago and it is indeed a classic. I loved it when I watched it years ago as a teenager and I still love it. I truly adore and love the character played by Mohan. He delivered his role beautifully. It’s one of my favourite movies by Mani Ratnam. 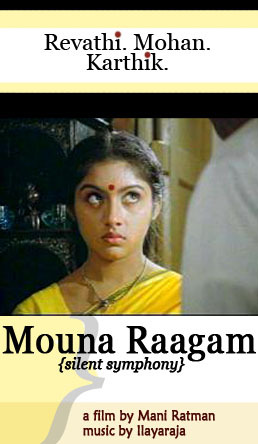 MOUNA RAGAM is another lesson for all directors in setting up characters. The way Mani Ratnam introduces them in a just-another-morning-in-the-house fashion is so telling. It establishes all the interpersonal relationships so well, and so economically. While there’s plenty to love about this movie, music especially, I’ve always found the second half to be a tad immature. Perhaps it was alright back in the day, but a recent viewing didn’t go down all that well. But the music, oh the music! Happened to watch it fully for the first time last week. Three things: Mani Rathnam’s Script, P.C.Sreeram’s camerawork and blasphemy if I have to spell it here, music by Him. The taking was spectacular, especially considering such stories are a dime a dozen. P.C.Sreeram changed the way the camera focuses on actors and the lighting was simply revolutionary. The pauses, the angles and the motion, superb. He said that Manirathnam visualized the scenes and it was up to him to execute them. Can’t say who gets the credit here: the creator or the executor. Nevertheless I still can’t imagine any scene without the music. What music it was!! The songs are out of this world too. There are many spectacular movies these days, but seldom do people associate music with any of the scenes. When we say Mouna raagam, we seem to remember only its music, sweet irony!! It will be so for many years to come. ‘Adapted’ from Nenjathai Killadhey huh? Interesting way to describe intellectual thievery, some might say. Since ‘Nayagan’ was also adapted even more from gawdnaina Mani Ratnam sir is, arguably the greatest ‘adapter’ in the world! Interesting how his un-adapted works stack up in comparison to the adapted ones.